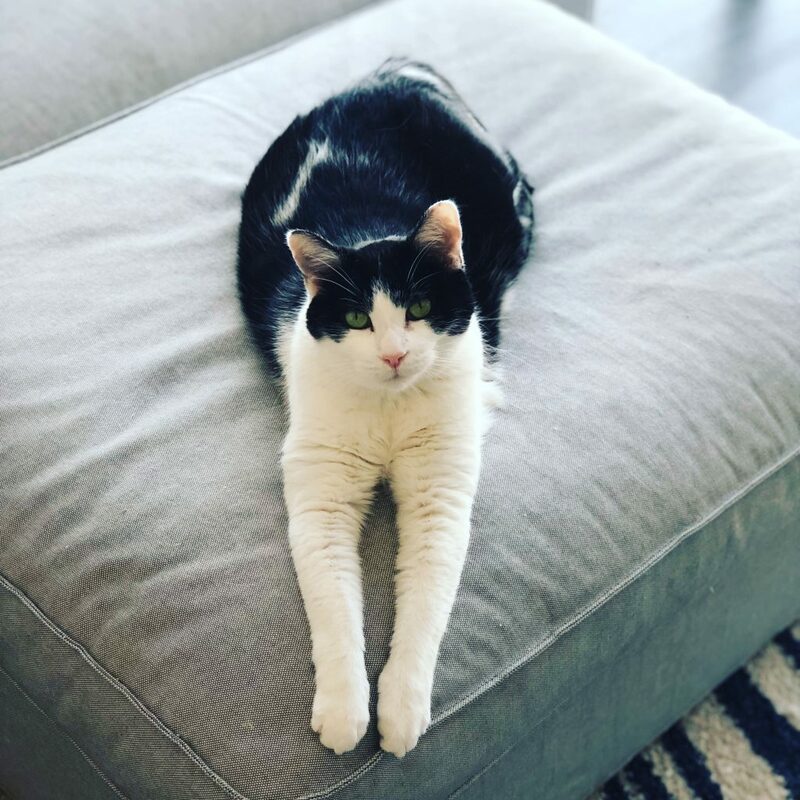 At Tree House, we believe every healthy and treatable cat deserves to have a forever home – including cats with special needs and chronic illnesses such as Feline Leukemia Virus (FeLV). 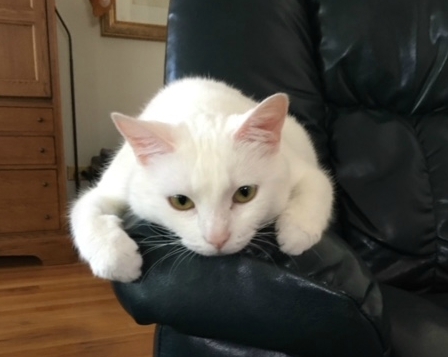 Many people are unfamiliar with FeLV, and, sadly, many cats who have the disease are euthanized due to a lack of adequate resources or knowledge. FeLV positive (FeLV+) cats can live happy and healthy lives even though their lives might be shorter than an FeLV negative cat. 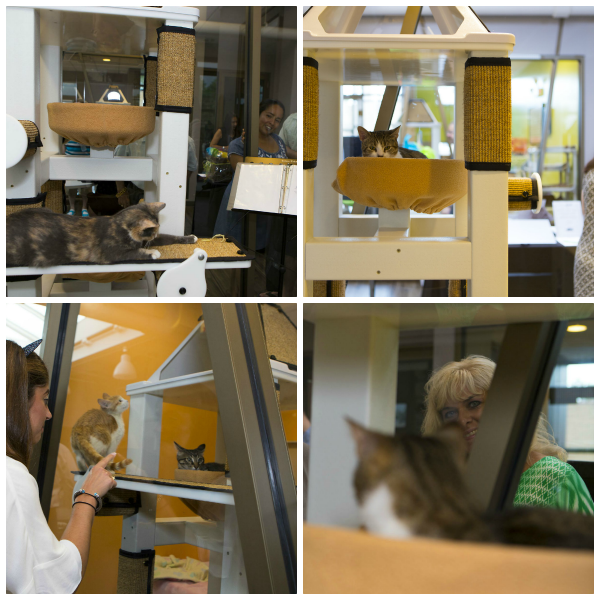 Tree House knew there had to be a better way, so we created a permanent FeLV adoption room at our new shelter. 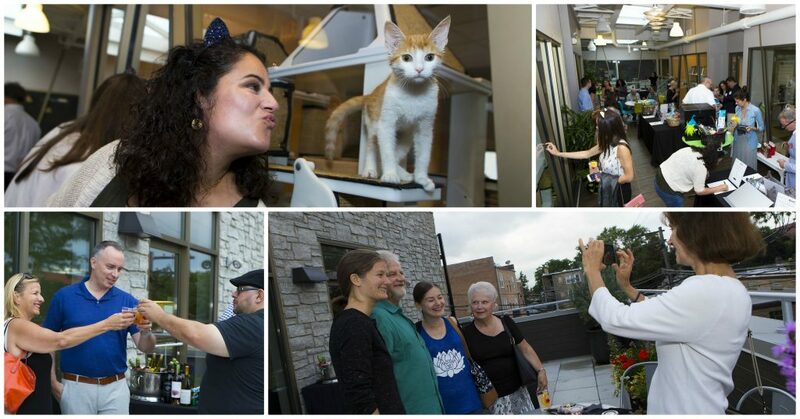 Tree House became the only shelter in Chicago, and one of the few in the country, with a dedicated adoption program for FeLV+ cats. Since that time, we have become a resource for shelters throughout the Midwest, and many FeLV+ cats have been transferred to Tree House who might otherwise have been euthanized. 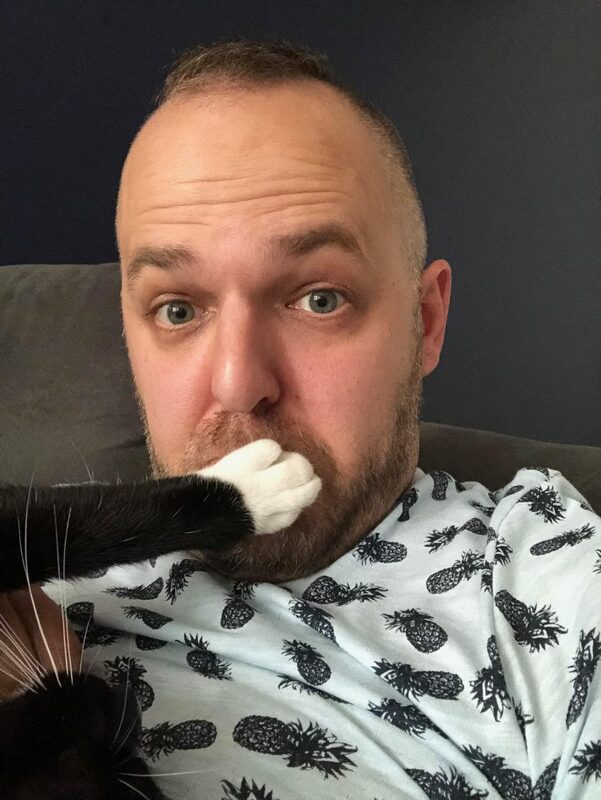 Contrary to some beliefs, FeLV is not cancer. It is a virus that breaks down a cat’s immune system, making the cat more susceptible to illnesses that otherwise do not impact healthy cats. These secondary illnesses are what typically lead to an FeLV+ cat’s death. While the estimated lifespan of a cat with FeLV is three to four years, we’ve had many FeLV+ cats who have lived much longer. Sherlock is a great example of a cat who is doing very well with FeLV. 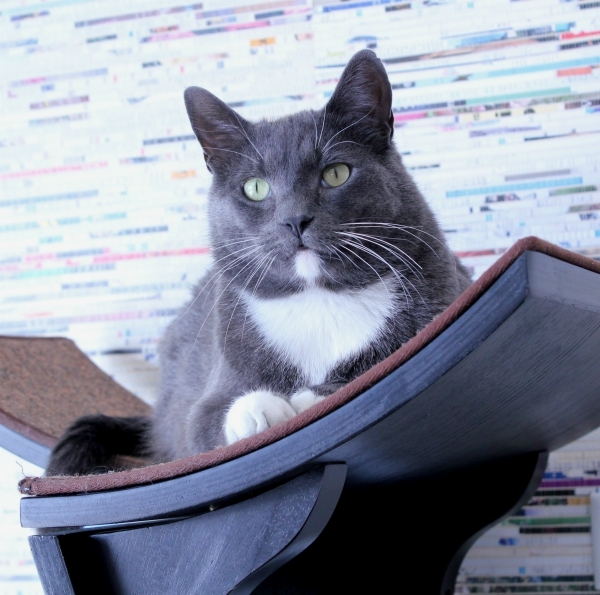 A burly cat with a great personality to match, Sherlock is a loveable guy who was transferred to Tree House from another shelter that lacked the resources to help him. 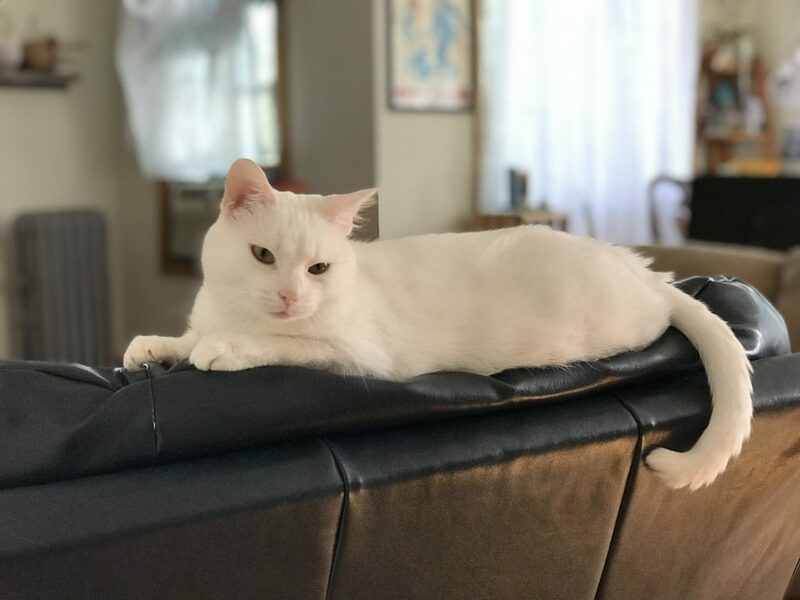 He is a healthy and happy FeLV+ cat who is now four years old. Curious and silly, Sherlock loves people, and it was a wonderful day when Morgan and Katherine came to Tree House for a visit and gave this great guy a home. After visiting several other shelters, Katherine shared, “I knew the minute I walked into Tree House that this was the place for me.” She returned that weekend with her husband. 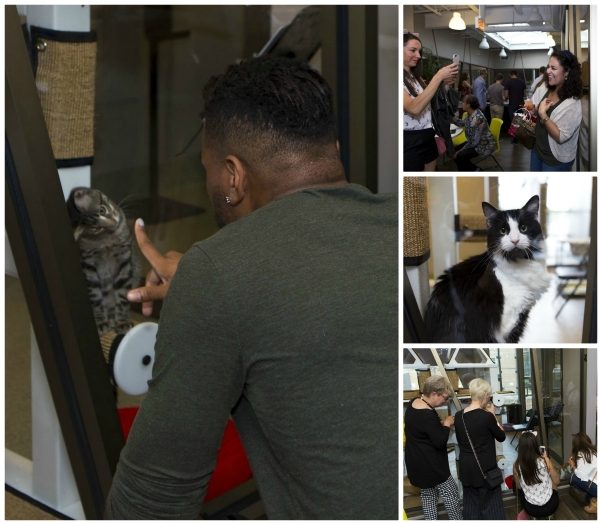 They were open to learning more about FeLV – it is always so heartwarming when potential adopters are willing to give cats with special needs a chance and take the time to learn more about FeLV. Sherlock likes to sit on his quilt and watch the traffic go by. 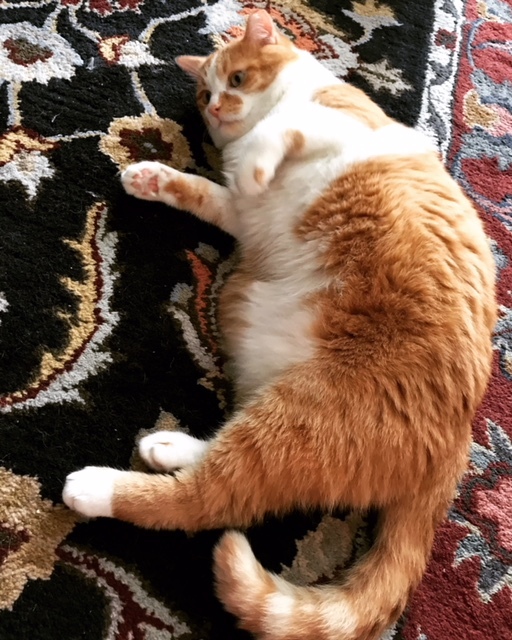 He loves all his toys – for about three minutes, and then it is time to clean himself and pretend he was not just acting the goof. He is a constant companion – on the couch, in the bed, and right by the chair at mealtimes. We are thrilled for Katherine, Morgan, and Sherlock. 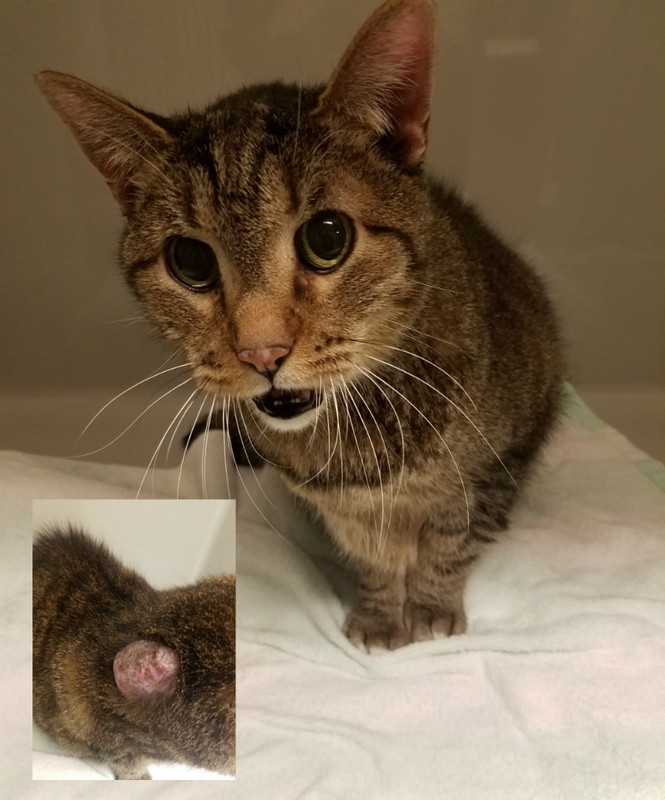 We hope this story inspires others to learn more about cats with Feline Leukemia Virus and to consider adopting them. These cats deserve a home, and while the time you have with them may be less, the love and joy they bring will fill your heart for much longer! Support our efforts to help FeLV+ cats and the many other cats who struggle with illness, injuries, and chronic medical conditions. 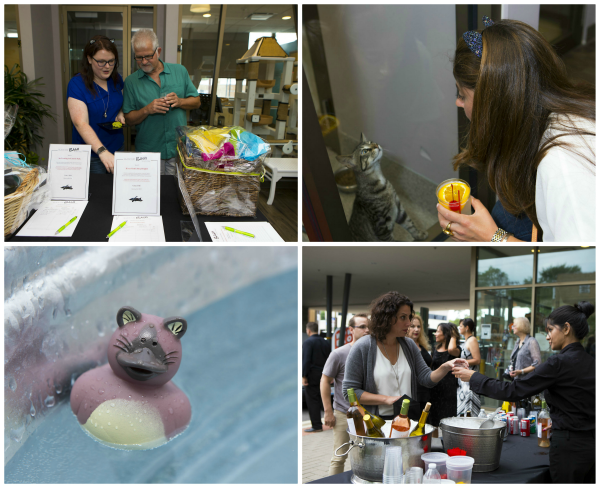 This year’s Black Cat Bash was a great night of food, fun, and furry friends. 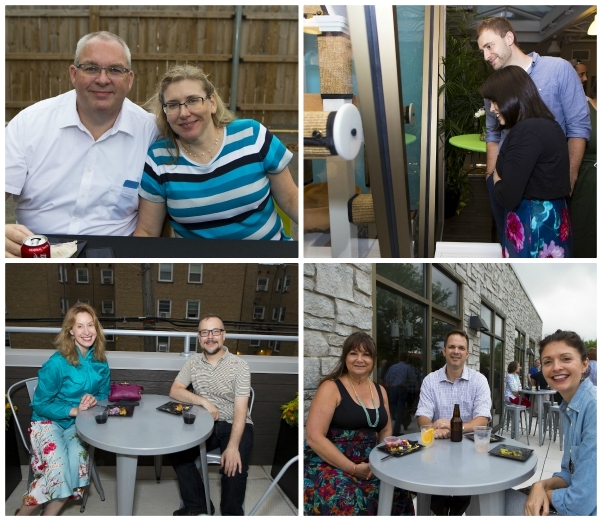 We had guests from throughout Chicagoland as well as from across the country! 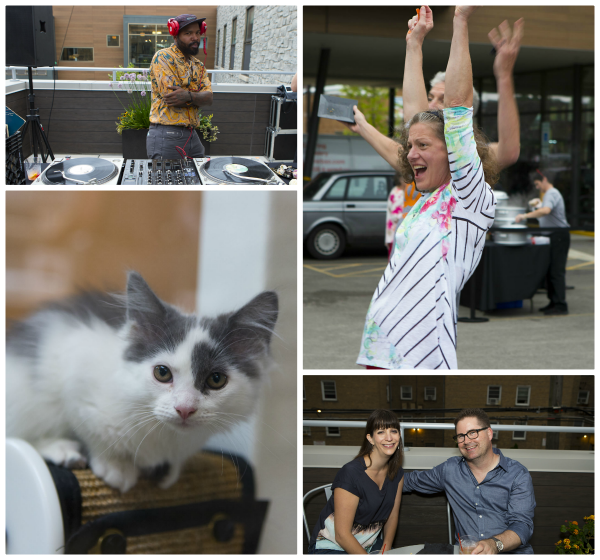 Proceeds from this event support our work to save sick, injured, and stray cats. Thanks to all our wonderful supporters. 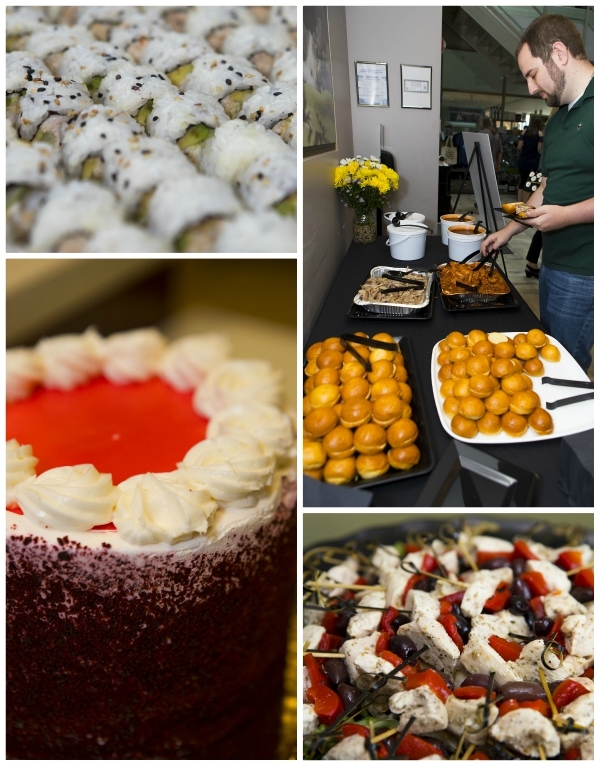 A big thank you as well to our tasting partners — Amazing Edibles, The Bad Apple, BUB CITY, Dream Cakes, Foodlife, HUB 51, Octavio Cantina & Kitchen, RPM Steak, and Wow Bao, for the incredible food! 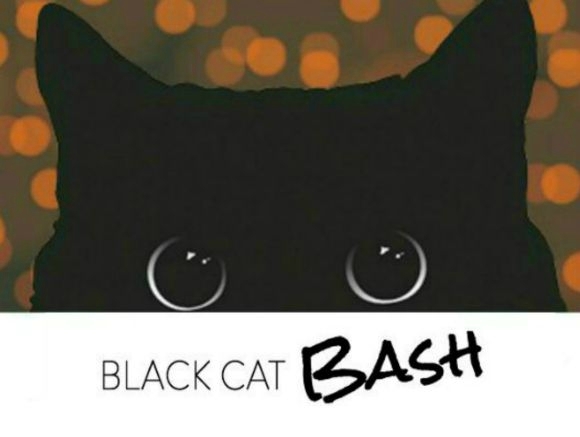 Thanks to everyone who supported the Bash. The homeless cats who were at the shelter that night were intrigued by all the activity, and it truly was all for them. Thank you for being a part of helping save their lives! While this is a bittersweet story, it is also a heartwarming one about two Tree House cats, Cloud and Cashew (pictured l to r), who found the loving forever home they deserved. After meeting various cats at our shelter, Jacob inquired about cats who were attention-seekers, similar to their cat Peanut. That’s when they met Cashew and knew he was the one. Cashew and Noodle became quick friends, and the family settled in. Cashew settled into his new home very well. He was an affectionate cat and a true love bug. 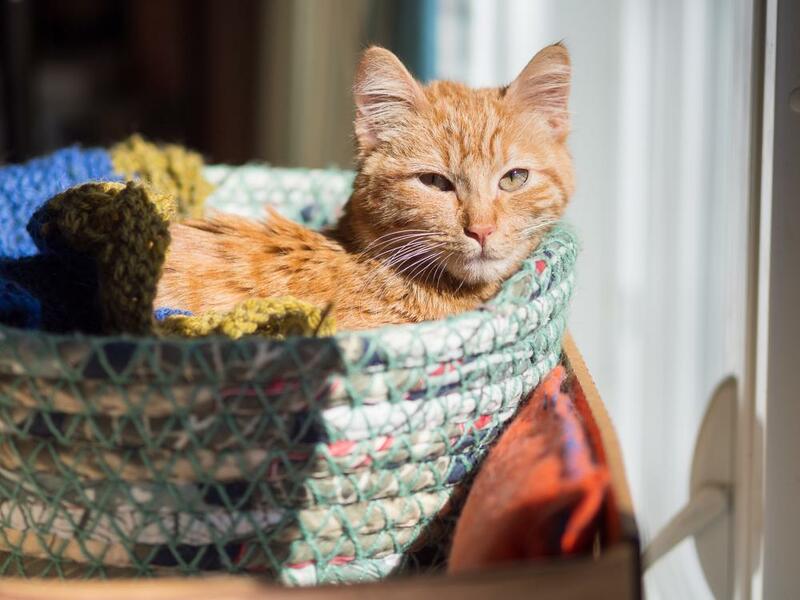 It was doubly heartbreaking when Cashew fell ill just a few short months after being adopted. He was diagnosed with cancer and passed away shortly thereafter. We are so glad he was able to have a loving home — even if only for a short period of time — and the care and compassion he deserved in his last days. It seemed to be fate that Cloud (who also resembles Cashew) was returned to Tree House the same day that Jacob and Matt also returned to Tree House to find a furry family member and to honor Cashew’s memory. Cloud had been adopted from Tree House shortly after Cashew but was returned through no fault of her own. Ironically, as she waited in our clinic admissions room, Jacob and Matt had been meeting other cats in our cat adoption rooms. They hadn’t quite met their match, and Tree House staffers just had a feeling…. Staffers asked if Jacob and Matt would like to meet Cloud. 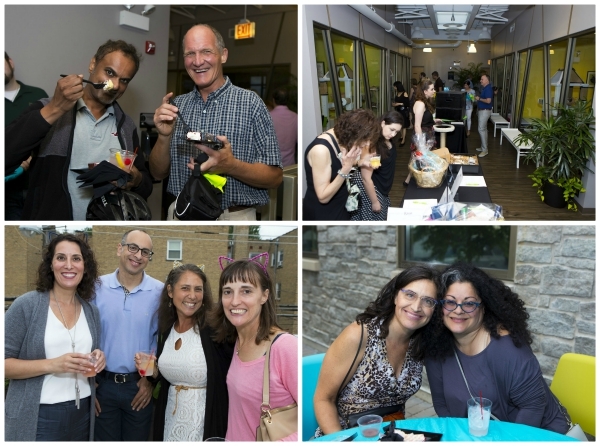 “What a trip Cloud was…she chatted and chatted and chatted. We were able to get her to play with a string toy, and after that, she rubbed our legs and continued her serenade.” Fate truly stepped in that day to bring this family together. Cloud settled in quickly…it only took her a couple of days to manage to escape from the bedroom, and Jacob found her resting calmly in the living room with Noodle nearby. It was clear that these two cats were going to be the best of friends. Cloud and Noodle are very close and often cuddle together. We are incredibly grateful to Jacob and Matt for all the love they have shared with all of these cats. As so many can appreciate, grieving the loss of a beloved pet is painful and takes time. We are glad that Cashew received so much love in his final months and days and that Cloud received the gift of a loving home in his memory. We wish the entire family (furry and human) many happy years together. 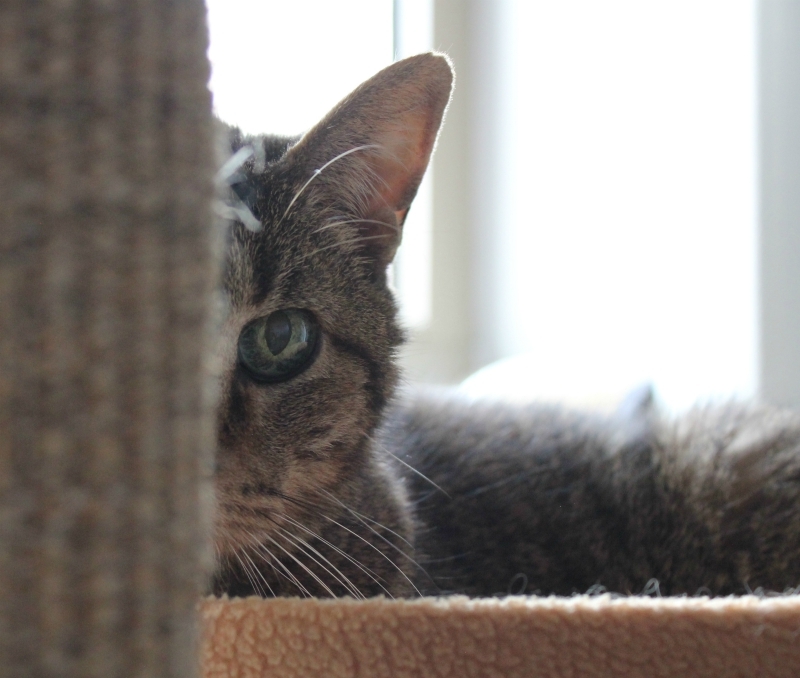 We are happy to share an adoption update about a senior cat who now has a second chance. Goofy (now named Cairo) was in need of a new home after his guardian suffered a serious illness and could no longer care for her cats. It was a heartbreaking situation. Fortunately, Cairo did not have to wait long before he found his new home. Tami adopted a senior cat, Billy, from Tree House several years ago. 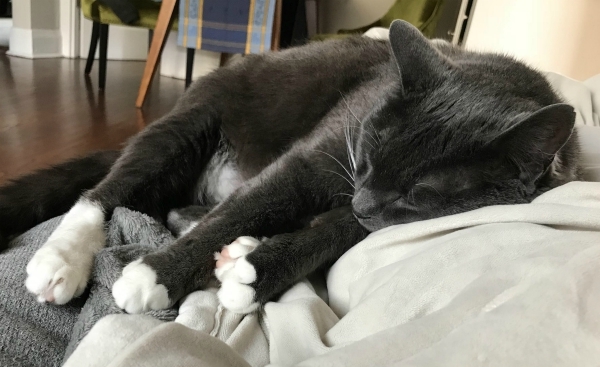 Sadly, this sweet cat passed away suddenly in May, due to a heart issue, and Tami’s other cat, Florida – whom she also adopted from Tree House, was left without a buddy. Tami knew she wanted to find a new friend for Florida and visited Tree House. Tami felt an instant connection with Cairo. “He was very shy when he first met me but also very polite. He is also very handsome – with a beautiful orange coat. He seemed like a wonderful cat, very dignified and calm.” She knew he was the one! When Tami took Cairo to his new home, he was very timid at first and hid under the bed or in the closet. While he had his own room to acclimate for a couple of weeks, Tami brought him out each evening to say “Hi” to the other cats. Florida and Cairo seemed to ignore one another, and Tami thought the two might not hit it off as she had hoped. But, they just needed time to adjust, and soon, their “catship” grew. 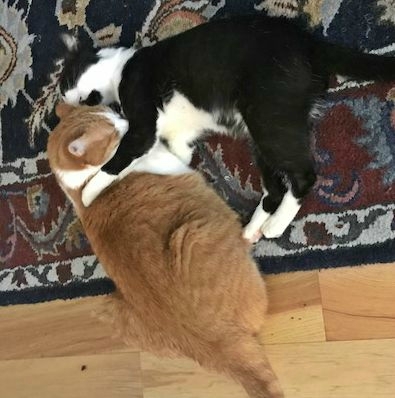 The two cats are now the best of pals – “they are always sleeping next to each other and giving nose kisses. 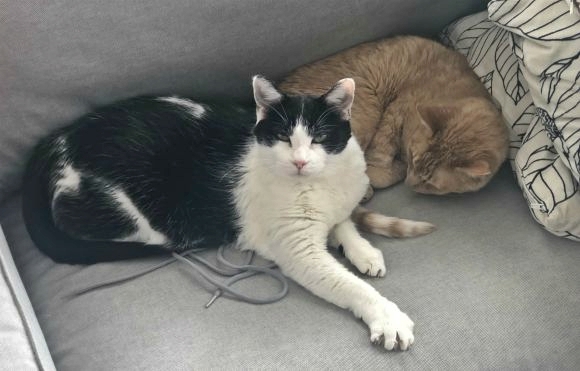 Florida is so thrilled to have a new friend, and I think Cairo is very happy to have a female cat who is very interested in him.” Cairo spends his afternoons sleeping on the sun porch and is quite fascinated with the birds and squirrels. We could not have said it better. We are grateful to Tami for giving this dignified and sweet gentleman a loving home. 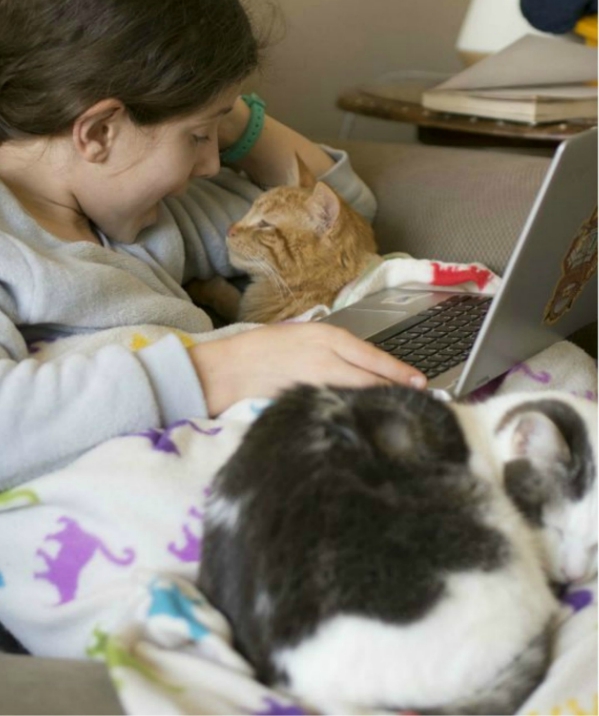 We hope this will help others consider the joys of adopting a senior cat. 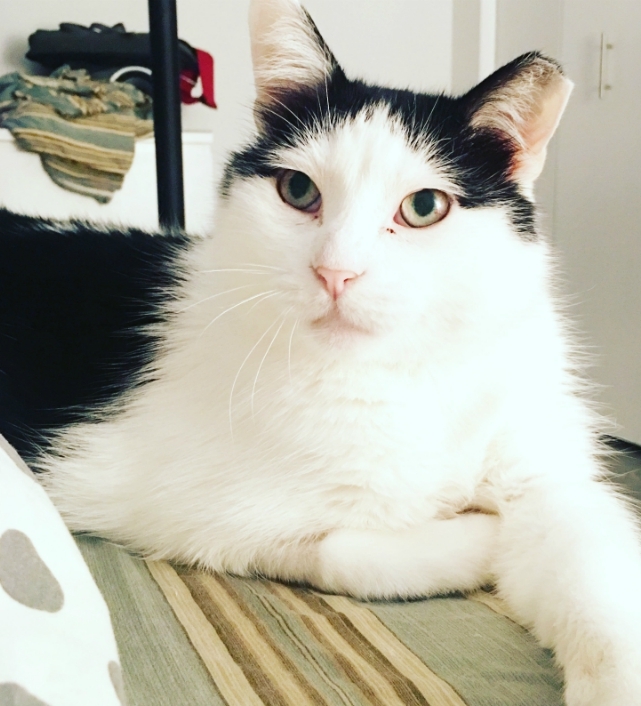 We are thrilled to share an adoption update on a special-needs cat who has come a long way. Some of you may remember a story we shared over the holidays about a kitten named Dabble. Tree House staffers found Dabble abandoned on our front ledge. Someone had placed him in a shoe box, punched holes in the top, taped it shut, and left him at our door. When we found him, his legs were listless at his side. 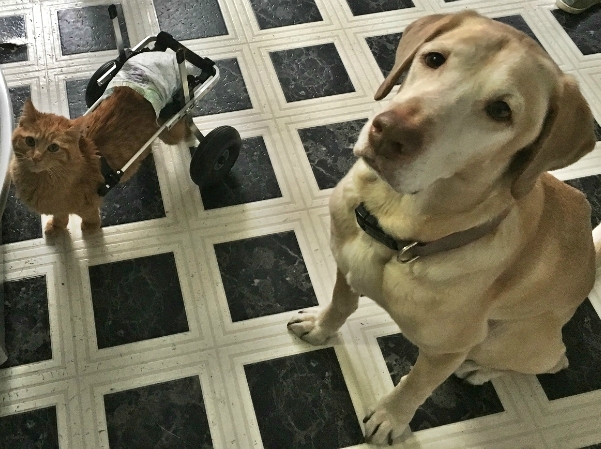 With months of physical therapy, socialization, and treatment, Dabble began to thrive, seemingly unphased by his disability. We were grateful to receive a cat wheelchair that was donated by an organization that offers pet wheelchairs for cats and dogs. Dabble took to his new cart quickly. Yet, he also figured out how to maneuver very well on his own – scooting and crawling – gaining incredible upper body strength. What had happened to Dabble remains a mystery. We determined his condition is most likely neurological. 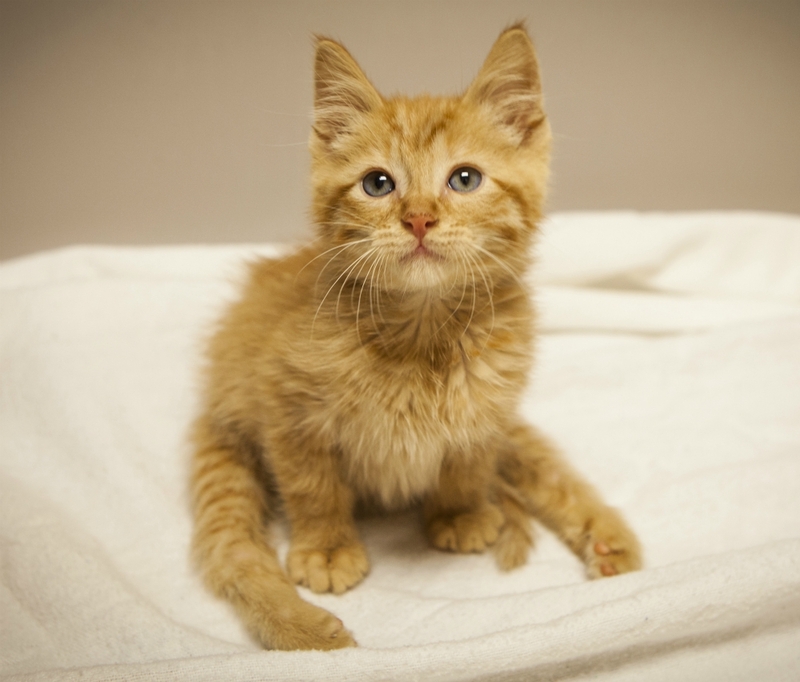 We began introducing Dabble to other cats and people in our cat adoption rooms. Little did we know it would not take long before a chance encounter would lead to a new home. Josh, Meredith, and their two children came to Tree House looking for a cat to add to their family. They were not specifically looking for a special-needs cat, but when they met Dabble, they could not resist. It was a triumphant day when Dabble headed to his new home. It has been several weeks, and Dabble has been doing remarkably well and is very happy having a loving home of his own. Meredith homeschools the children. Therefore, the family is home during the day providing a stable environment for Dabble with daily attention and care. 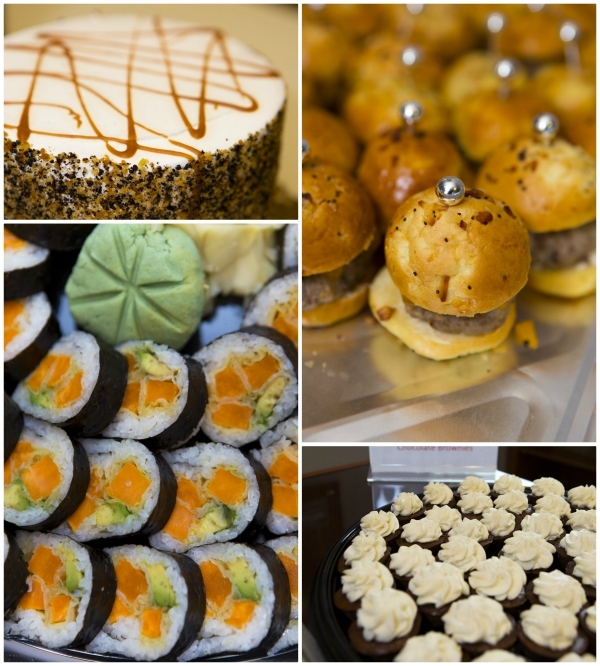 Meet the cook’s apprentices (a.k.a. the sniff masters). Dabble spends time in his cart each day (although he prefers to get around without it). He enjoys roaming in and out of the kitchen while Meredith cooks. He is often joined by the family dog, Bob, whom Dabble finds incredibly interesting. The two of them are endlessly fascinated by the various spices and curiously sniff each one. Here they are eagerly waiting for the next sniff test (or perhaps a little morsel). 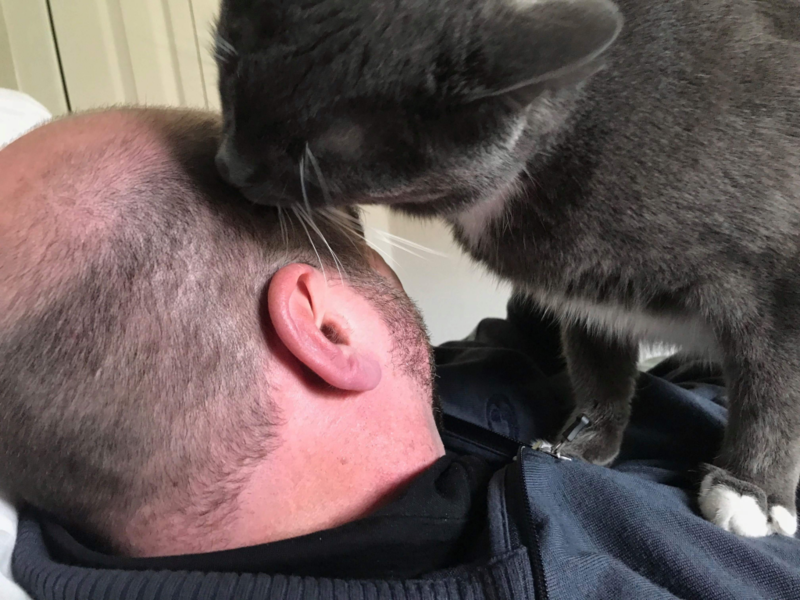 Dabble is a great study buddy (or perhaps more often a distraction – but that is what cats are for). And we’ve learned he thinks Roxy, the family’s other cat who is taking a nap here, is the coolest, most interesting thing in the world. 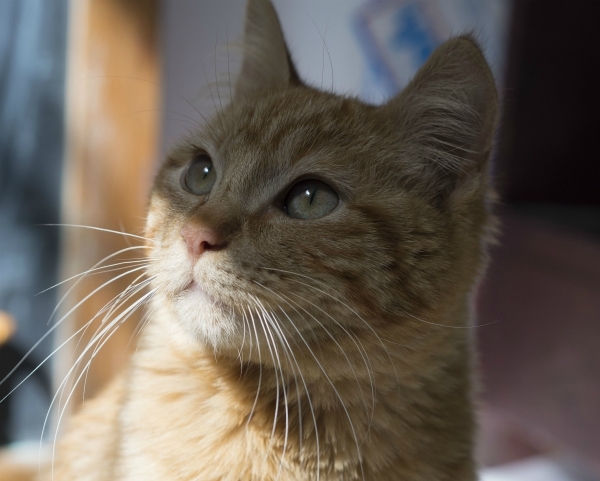 Dabble spent so much time in recovery, he had limited interaction with other cats. It is wonderful to find him so intrigued by his new cat sister. We wish the entire family – human and furry – many happy years together. We are grateful to Josh, Meredith, and their children for giving this special cat the home he deserved. At Tree House, we believe stray cats deserve a chance at a caring home, including those who might need extra care or who have physical disabilities or chronic illness. The joy and love these cats give in return is immeasurable. 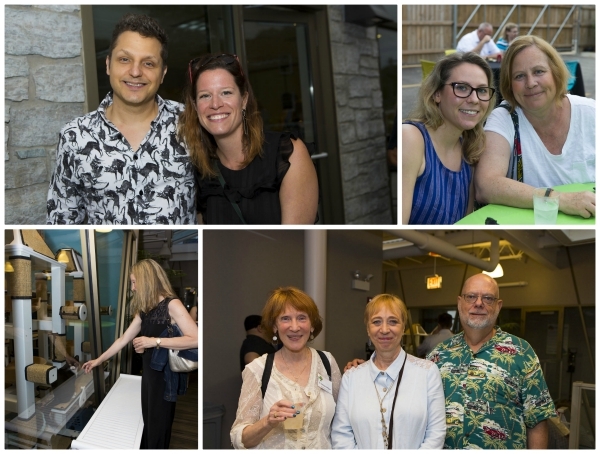 We are pleased to announce Raissa Allaire as Tree House Humane Society’s new Executive Director. She will be joining the organization effective Monday, May 21, 2018. Raissa brings a wealth of experience in nonprofit leadership including various roles over the past 12 years at The Center for Economic Progress (CEP). The Center is an award-winning, mid‐sized organization focused on improving the financial lives of 20,000 families in 15 Illinois communities. Most recently, she served as the Chief Operating Officer, overseeing the agency’s administrative operations and direct services and serving as a member of the organization’s leadership team. 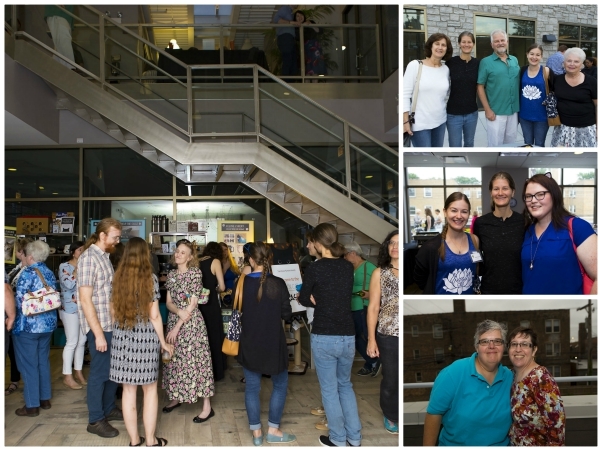 During her tenure at CEP, she was responsible for developing and leading the organization’s fundraising and re-branding strategies. Prior to joining CEP in 2006, Raissa served as a vice president for a Chicago museum and developed and managed communications campaigns for major non-profit clients as an account executive for a top-ranking public relations firm. Raissa earned her undergraduate and graduate degrees in Humanities from the University of Chicago. In 2016, she was selected for the Allstate Foundation’s Greater Good Leadership Program, created in partnership with Northwestern University Kellogg School of Management to help leaders transform their organization, community, and the nonprofit sector through year-long coaching and academic instruction. Raissa, her husband, and two sons live in Berwyn. 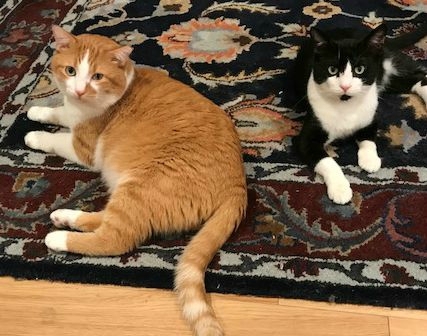 In 2016, Raissa and her family adopted Sulley and his son Sal, a pair of orange tabbies rescued from a hoarding situation. 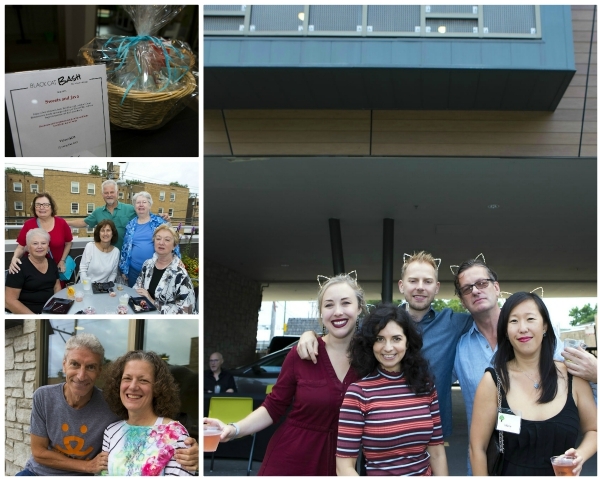 Since then, the family has made it their personal mission to find ways (small and large) to advocate on behalf of homeless cats. The Tree House Board and staff look forward to working with Raissa to expand our efforts to save sick, injured, stray, and feral cats. Please join us in welcoming Raissa to Tree House Humane Society.